The following individuals are being inducted as the Crawford County Veterans Hall of Fame Class of 2018. Ronald was born in Bell County, Ky on October 1, 1946, he was the third child of Elnier and Francis Fuson. Ronald attended Pineville High School where he played football, basketball and ran track, he lettered in all three sports. He graduated from Pineville High School in 1964. At age he moved to Ohio, to not have to work in the coal mines. He was drafted into the army in 1966 and joined for another year after first term was up. Basic training at Fort Benning, GA, AIT at Aberdeen Proving Grounds MD then on to Germany for 18 months of duty. He then received orders for Vietnam for 13 months. Ronald was discharged from service in January of 1969. Ronald married his high school sweetheart Sheila on Feb. 10, 1969. They had 46 wonderful years together until she passed in January of 2015. After serving his country, Ronald became active in the Veterans of Foreign Wars. He was Commander of VFW Post 2920 6 times, earning All-State Commander twice. He held the position of Quartermaster twice and several other offices over his many years as an active member. He was active with the community of Crestline and Crestline High School students, getting information for the Voice of Democracy essays and VFW Scholarships. He was also active with the VFW color guard marching in parades and attending to funeral rites. He is also a member of the American Legion, Amvets, Eagles, Owls, Board member of Crawford County Veterans Hall of Fame, but most of his time he has served on many veterans’ boards and still does. Crawford County Veterans Hall of Fame is honored to induct Ronald Lee Fuson into the class of 2018. Dean was born November 14,1951 to Gertrude and Hubert Phillips near Tiro, Ohio. Dean was the 4th of 11 children. He attended grade school at Mother of Sorrows Catholic School in North Auburn. His mother died when he was 14 and his father raised 11 children by himself. Dean attended Buckeye Central High School in New Washington, Ohio where he played baseball and ran track. He had to find a ride or walk 3 miles to practice or a game. He graduated in 1969 from Buckeye Central High School, and worked at R.R. Donnelly in Willard, Ohio until he was drafted. On May 10th, 1972 at 10:23 hours pilots Cpt. Barry C. Tomlin and 1st LT. Samuel Harrell and a crew of 3 were aboard United Flight 157 enroute from Bien Hoa to Vung Tau. United Flight was part of a 4-ship flight of Ch-47 Chinook helicopters that picked up Infantry Troops from 3rd Brigade 1st Cav at Sandy Pad at Bien Hoa Army Base. The troops were being taken to Vung Tau for 3 days of in country R+R. As Flight 157 neared Long Thant North Army Base Airfield, other Chinooks in the flight described 157 exploding like a light bulb flash. Since there had been an increase in NVA activity at AnLoc, the aircraft was thought to have been shot by 23mm anti-aircraft fire or aSAM-7 missile. At 10:25 hours Long Thanh tower received a radio call from aircraft in the vicinity that a CH-47 had crashed to the northeast of the air field and had exploded on impact. Aircraft in the area reported no sign of survivors. After an investigation the aircraft was brought down by mechanical failure. On May 10, 1972 Crawford County lost two friends and comrades PFC. Dean Anthony Phillips and SP4 David Suler of Galion, OH. Dean’s name is on Panel 01W line 20 and David’s is on Panel 01W line22 on the Vietnam Veterans Memorial in Washington, DC. 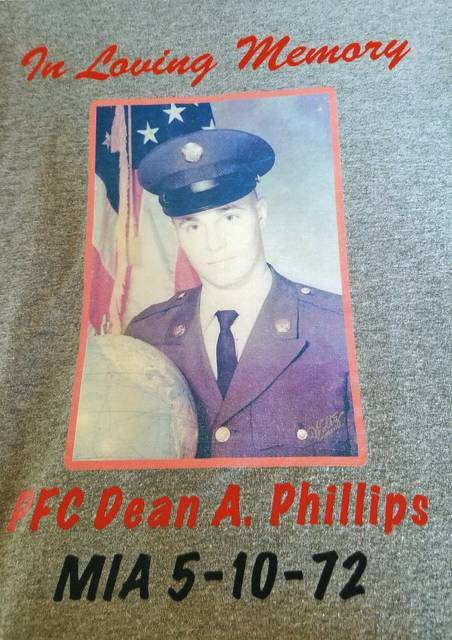 The Crawford County Veterans Hall of Fame is honored to induct Dean Anthony Phillips to the class of 2018. Donald F. Heydinger was born December 11, 1922 in Cranberry Township rural Crawford County to Otto and Josephine (Durnwald) Heydinger. He graduated from New Washington High School in 1941. He enlisted in the United States Army Air Force on February 20th, 1943. 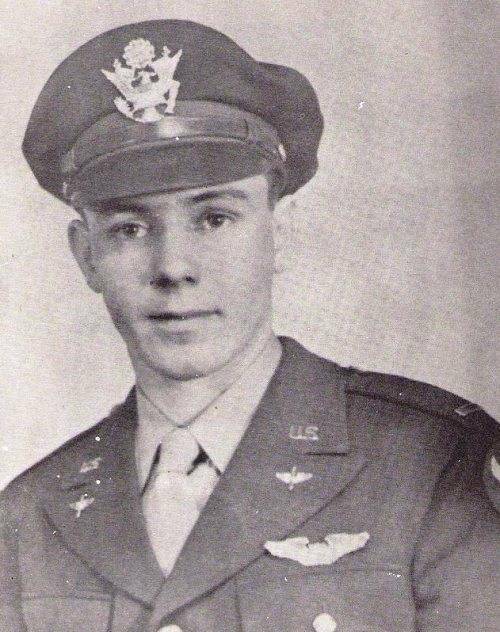 After nearly a year of training he graduated on April 15th,1944 as a Second Lieutenant and received his Silver Wings at Craig Field Alabama. On the 23rd November 1944 while attached to the 336th C.C.T.S. (Combat Crew Training Squadron) at the Army Air Field at Sarasota Florida, where he had been in fighter plane test work, and while making a test flight in a P-51D Mustang (44-15633) the aircraft suffered catastrophic engine failure. Lieutenant Heydinger attempted to eject out of the aircraft approximately 16 miles east of Bradenton Florida. It appears that his chute failed to open, and it was caught in the tail of the plane and partially damaged causing Lieutenant Heydinger to fall to his death. The USAAF did not attempt to recover the aircraft and it remains buried in the Florida swamp. At the time of his death Lieutenant Heydinger was survived by his parents, grandparents, Mr. and Mrs. Pete Heydinger and Mr. and Mrs. Joseph Durnwald. His five Brothers, Pvt. Harold Heydinger of Camp Blanding Florida, and Gilbert, Glenn, William and Allen at home. His four sisters, Mrs. Louis (Viola) Karl, and Mrs. Robert (Bertha) Karl and Vera and Inez at home. Two brothers and one sister preceded him in death. Lieutenant Donald F. Heydinger is buried in St. Bernard’s Catholic Cemetery, New Washington Ohio. 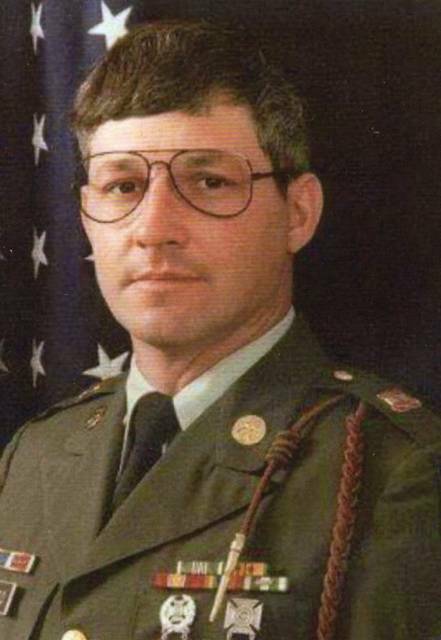 The Crawford County Veterans Hall of Fame is honored to induct Lieutenant Donald F. Heydinger into the class of 2018. Garland was born February 2, 1948 in Portsmouth, Ohio to the late Paul and Katherine Bloomfield. Garland has two brothers, Paul E. Bloomfield of Marion Ohio and Army veteran William D. Bloomfield of Bucyrus, Ohio. Garland attended Crawford Elementary School, Bucyrus Junior High and graduated from Bucyrus High School in 1967. During high school Garland worked at General Hydraulics in Bucyrus. Garland was drafted in November of 1967. He took basic training at Fort Lewis Washington and AIT at Fort Belvoir Virginia. He was assigned to Vietnam in 1968 with the 23 MP Company and was discharged in 1969. Garland reenlisted in 1980 in the 837th maintenance department US Army and was sent to Germany for 4 years and discharged in 1985. Garland enlisted in the US Navy in 1985. He did basic at Great Lakes, then his schooling in Virginia. He then was assigned to US Naval Personnel Center of New Orleans, LA. He was a jet engine tech. He then served in the Persian Gulf. Then his last assignment was at Norfolk Virginia. When retired from the Navy he was ranked Petty Officer 2nd Class. His awards include Vietnam Service Medal, Vietnam Campaign Medal, (4) Army Commendation Medal, National Defense Medal, 2 Army Service Ribbons, (4) Good Conduct Medal, Navy Achievement Medal (3) Armed Forces Expeditionary Medal, and Sea Deployment Ribbon (2). Growing up in Bucyrus and after graduation he made the decision to join the military and was honored to serve his country. Sadly, Garland passed away on September 14, 2004. Garland has two children Kim E. Winstead of North Carolina and Nathan A. Bloomfield of Bucyrus, Ohio and one granddaughter Rhiannon of North Carolina. The Crawford County Veterans Hall of Fame is Honored to induct Garland Ray Bloomfield into the class of 2018. Jim Heydinger was born just outside New Washington, Ohio on January 2, 1931 to the late Albert and Rose Heydinger. He grew up on the family farm on Swabb Rd. One of eleven children, seven of them served in the us Armed Forces. Jim enlisted in the US Air Force at Bucyrus, OH on January 5, 1951 and attended basic training at Lackland Air Force Base in San Antonio, TX; he then completed gunner training at Lowry Air Force Base in Colorado before being deployed to Pusan, Korea as part of the 729th Bomber Squadron. He was a tail gunner on a B-26 bomber and completed 55 missions before being returned stateside and honorably discharged on October 23, 1953. 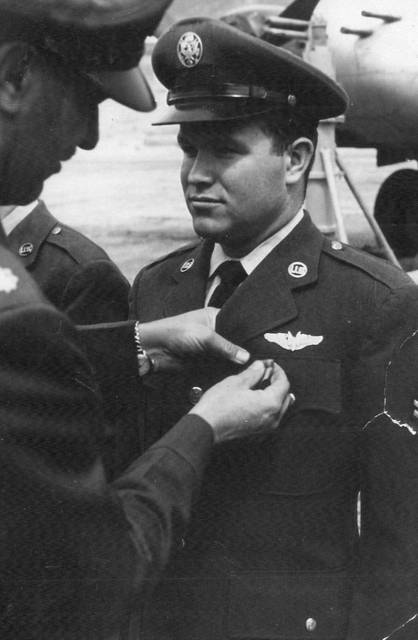 Jim received the National Defense Medal, Korean Service Medal and Air Medal w/ oak leaf cluster. Jim graduated from Chatfield High School class of 1948 and then Northrop Aeronautical Institute in California receiving his Airframe and Power Plant Mechanic certification. He then went on to be a FAA certified Aircraft Inspector along with earning the following pilot ratings; Instrument, multi-engine, Commercial and Airline Transport Pilot. Upon returning home from Korea, Jim worked for the Pennsylvania Railroad as a blockhouse operator for 2 years, leaving to attend mechanic and training. In 1960 he started working for Fisher Brothers Aviation at Galion Airport as a mechanic, A&P Inspector and Pilot, he retired in 1991. Jim was a 60-year member of the New Washington American Legion Post 405. Jim was very active in his community volunteering with his son’s Boy Scout Troop (304 in Galion) in several positions including Committee Chairman. He was also active in Knights of Columbus Council #1234 and serving the 3rd Degree as Grand Knight and 4th Degree Navigator through St. Joseph’s Catholic Church. Jim was also a 50-year member of the Galion Elks Lodge. In 2009 Jim was awarded the Charles Taylor Master Mechanic Award by the Federal Aviation Administration at a ceremony in Cleveland, OH. In 2012 Jim was selected for the Honor Flight to Washington, DC. In 1965 he married Miriam Snyder and the had 3 children, Jim passed away in August 2015. 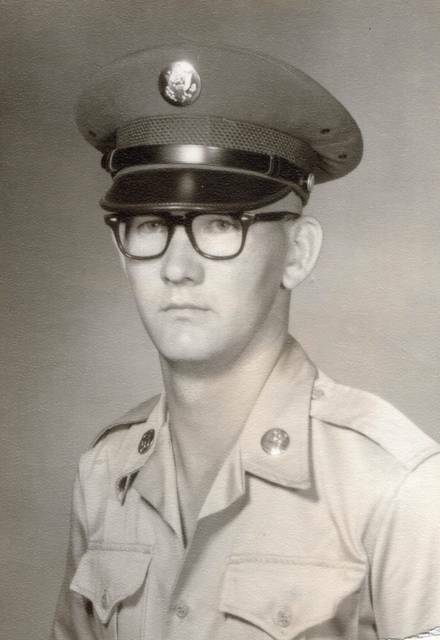 The Crawford County Veterans Hall of Fame is honored to induct James A. Heydinger into the class of 2018.